Imagine for a minute what your home would smell like if you left the garbage simply to rot away in the kitchen receptacle for days and weeks. This is exactly what is happening to the food that is trapped in your kitchen pipes from a garbage disposal not functioning properly. The reason many disposals have so much trouble is the homeowner simply places the wrong items into the disposal, and that food remains trapped inside the drains. What Foods Should Not Go in the Disposal? The wrong foods not only can damage the blades of the disposal, they can easily get trapped in the pipes, allowing other foods to get trapped. That trapped food is the source of the odor, and reducing some of those foods from getting into the drain will lessen the likelihood it will smell. Never put bones or egg shells into the disposal because they will damage the blades. Do not put grease or oil into the disposal, they will solidify overnight and lead to clogs. Rice and spaghetti will continue to expand after being in the disposal, leading to a clogs deep down in the pipe. Why Does the Garbage Disposal Smell? 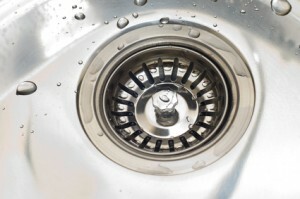 The reason that the garbage disposal smells is certain food particles that are not liquified get trapped in the pipe. The more food that makes its way into the pipe, the more it accumulates in that one location. The smell of the rotting food travels up through the pipe and out the kitchen sink. The longer those foods remain trapped in the pipe, the worse that smell will become. It is best to call in a professional plumber to properly clean the plumbing and eliminate that odor. What Can a Plumber Do to Eliminate the Smell? Your local plumbing professional will first locate the source of the clog, then access the pipe and begin cleaning it. Having a cleaning at least once a year will prevent certain foods from being able to stick to the inside of the pipe. The plumber will then use organic cleaning compounds to clean the pipes leading from the disposal, removing any and all particles that might be trapped inside. Once the pipes are thoroughly cleaned, the home will no longer have that strong odor of rotting food in it. Schedule a preventative maintenance cleaning at least once a year to keep the disposal running more efficiently. If your home is in need of garbage disposal services, call Heidler Inc. at (410) 268-7191 for the best services in the Annapolis area.